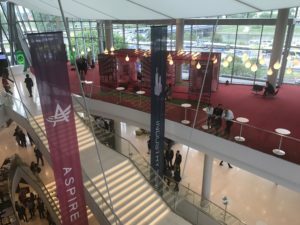 Podium Investment became the diamond sponsor of the prestigious Brave New World conference, organized by the ASPIRE Association. This annual event, enjoying huge popularity, is addressed to representatives of the business service sector. The conference was held on 15 May in the modern ICE Cracow Congress Centre and gathered nearly 2000 people. The event was devoted to the modern business service market, which is one of the most important sectors of the Lesser Poland economy, in which about 70 000 people have already found employment. For many years, Cracow has been perceived as one of the most important centres of modern business services. This trend has a huge impact on the office real estate market in our region, as well as the development of many outsourcing companies. During the Brave New World conference, the current situation in the industry was discussed, which continues to record further increases. Podium Investment has supported this initiative for the second time.